Call it what you want: old school, traditional, or true, you know classic heavy metal when you hear it, and hell yeah, you love it. And it's still alive and well thanks to bands like Sweden's Enforcer. 'Into The Night' (possibly a small nod to Def Leppard's first LP) is full platter of traditional metal that tips a broad brim of the hat to NWOBM, old school US metal and speed metal. If you hear Maiden, Saxon, Savage Grace or early Exciter, you're not to far off. Enforcer knows their history and has the talent and testosterone to pull off this style with 'balls to the wall' skill. 'Into The Night' is a whole lot of headbanging fun. The disc begins with two ripping speed metal numbers, but really hits the throttle and true form with the masterful title track. Even better is the next track 'Speed Queen' with its breathless pace and reckless abandon. Another blazing good ode to all things heavy metal is 'Curse The Light' that easily weaves the pace of speed metal with the harmony of basic melodic metal. Yet, the number that steals the show is the instrumental 'City Lights' which blends all the movements (including some rather impressive blues licks) of classic heavy metal into one brilliant piece. Great stuff! If there are dull moments, they were hard to find. 'On The Loose,' though certainly pleasing, didn't quite live up to it's title. The pace seemed slower and arrangement less assured then the other material. In the end, Enforcer's 'Into The Night' is well composed and expertly delivered classic heavy metal. This is not merely a trip back in time, but rather a reminder of why we (especially those of us with a little more gray hair than the current generation) came to love metal in the first place. Very recommended. 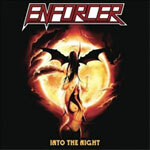 Enforcer's 'Into The Night' is well composed and expertly delivered classic heavy metal. This is not merely a trip back in time, but rather a reminder of why we (especially those of us with a little more gray hair than the current generation) came to love metal in the first place.